In my post about trying a recipe from an America’s Test Kitchen (ATK) I expressed my dissatisfaction with the balance between the kale and the rest of the ingredients. I think I may have stumbled on a partial solution. I’m admitting that in single-serving cooking I use frozen vegetables. One reason is that I can put the “leftovers” back into the freezer and not be pressured to use the rest of it right away–I’ll also admit to being a picky eater, par excellence as you’ve probably figured out. Note my comments on meal planning. Another is the nutritional value and quality of GOOD frozen products–we’re not talking “heat-‘n’-eat” here. We’re talking fruits, vegetables, perhaps fish, etc. I don’t mean that I don’t buy fresh from local suppliers, but probably frozen is better than not bringing home fresh kale because it’s packaged (even at the Farmers’ Market) in a huge bunch that just doesn’t work for me. (Cat just doesn’t eat enough vegetables for that to work, just like he doesn’t help with dust-bunny control). I made this again, adjusting the seasoning–mostly just adding more of what was called for–but using the frozen kale from Stahlbush Island Farms and it was not overwhelmed by the kale. 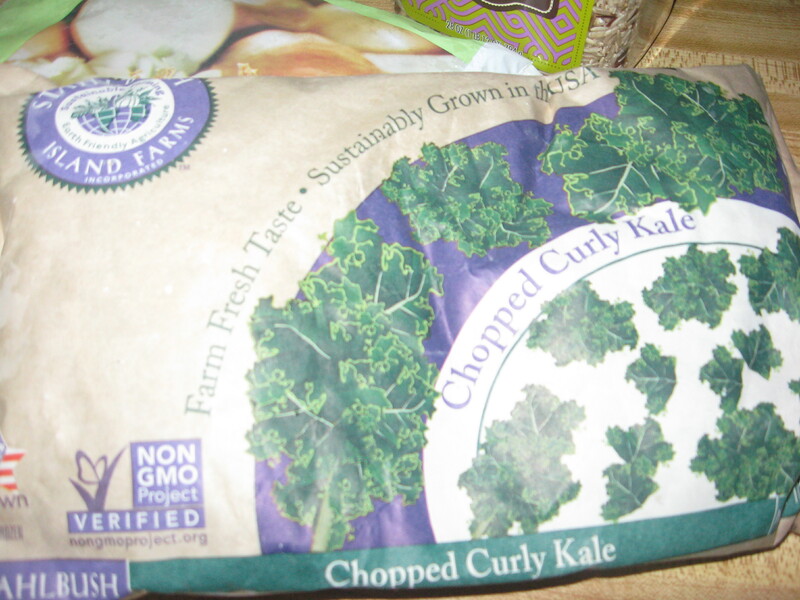 (Their website says it’s curly kale, but it must be younger leaves that what I had before.) There will definitely be more of their kale in my freezer and I’ll make this again with these adjustments.